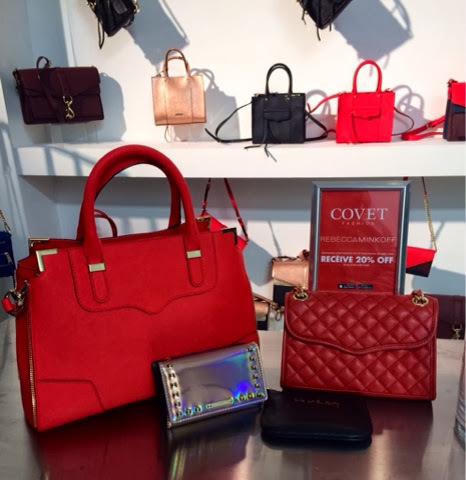 Yesterday I was able to attend the Rebecca Minkoff and Covet Fashion event in New York City! 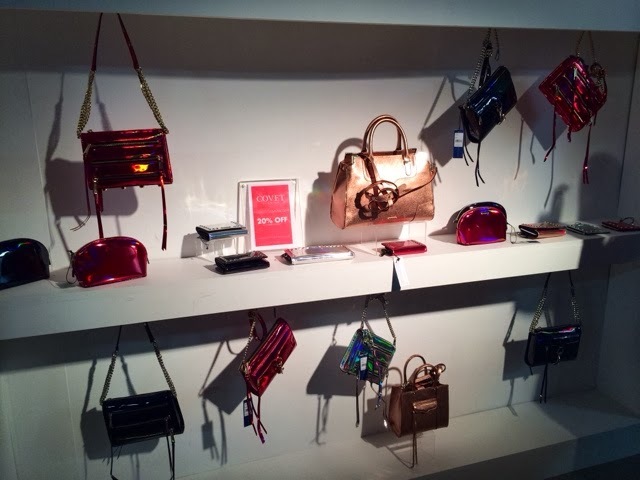 Rebecca Minkoff, like many fashion and beauty brands, has set up a pop up shop for the holiday season located at 427 West 14th Street and is open from November 25th – December 22nd, 2013. Covet Fashion is an app where you can bring out your inner stylist. Create outfits from major fashion brand collections to fit themes and have other users rate your look to win credits towards more clothes. At the event they handed out cards with 10,000 free points to use in app. At this event each half hour a Rebecca Minkoff bag was given away! The prizes were: a black Cory Pouch with the quote "Life of the party!" emblazoned in gold, a hologram Marisa Studded Wallet, a red Mini Affair Diamond Quilt Bag and and last but not least a red Amorous Satchel. This pop up shop is definitely centered on bags. They're hanging from all the walls and you can see them everywhere! No complains from me. Also available are racks of beautiful Rebecca Minkoff clothing, shoes and a TRESemme hair bar! 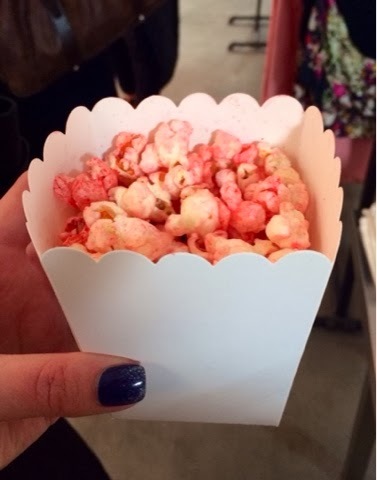 The event had little glasses of champagne and treats like pretzels and even pink popcorn! It tasted like regular popcorn, the pink punch was just adorable. They really thought out their event very well. The staff was very welcoming and helped address any questions or concerns for the attendees. When the first prize was called for the Cory Pouch I was so surprised to hear my name! This textured pouch is made of leather and is the perfect size to hold cash and cards. This pouch comes in black or red. 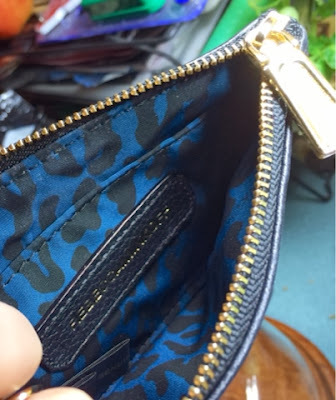 There is a divider in the middle making two separate pockets. The inside is a beautiful blue leopard print with a Rebecca Minkoff leather signature stitched inside. 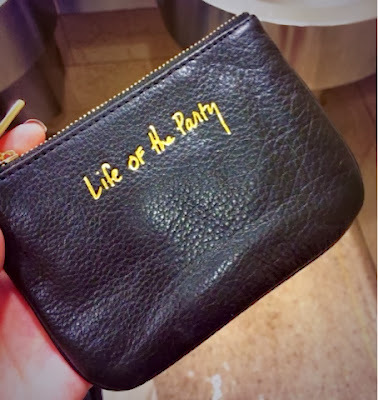 One side has a small Rebecca Minkoff gold name plate, on the other 'Life of the Party' is imprinted in gold. I can't wait to use this on nights I go out to hold my cards, cash and other little necessities like lip gloss! For the majority of the event, my +1 Michelle and I checked out all of the amazing fashion and made Christmas lists. Can you blame us? 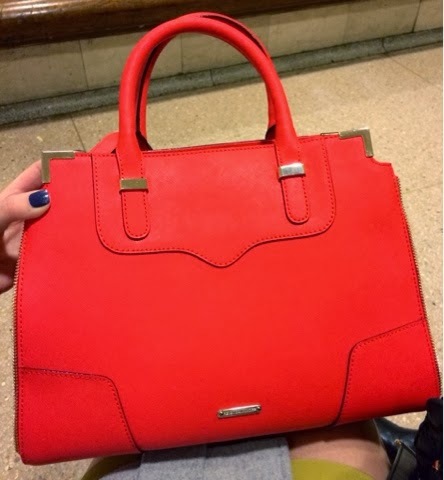 At the very end of the night they called the very last prize, a red Amorous Satchel worth $325! My friend Michelle was called! She was in total disbelief. The Amorous Satchel is made of saffiano leather with stitching detail and an exposed zipper on the edges. 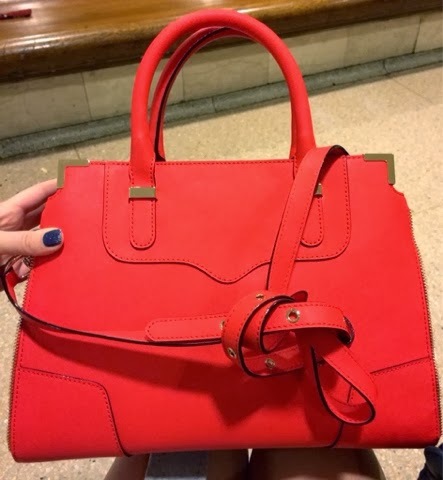 This is the perfect hand or shoulder bag. As we left we were given a few more goodies. 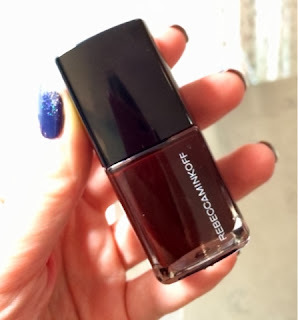 With purchase you can get this Rebecca Minkoff polish in Lust as a gift. Lust is an almost jelly like maroon shade. One coat gave me a light red streaky coat with darker streaks. Once I layered it to three I got an opaque full color that appears plum or maroon. Because it does have a slight transparency to it in the light the polish appears brighter and lighter while indoors it stays moody and dark. It's super shiny too! Final verdict: I like it! 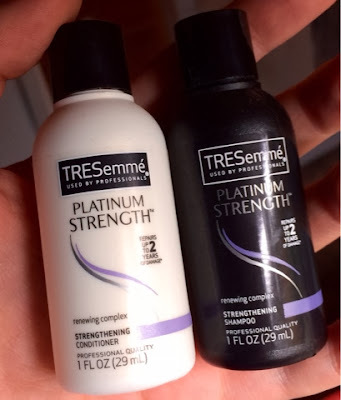 The other little extra was TRESemme's Platinum Strength shampoo and conditioner from the TRESemme Hair Bar. These little samples will go to good use in my shower and hopefully fix a lot of damage (up to 2 years worth of it) as the packaging claims. If you're in the New York City area and want to stop by the pop shop I would really suggest it! There are some beautiful high fashion items you can check out and add to your own holiday wish lists. Looking for a great look for your hair? Stop by and the TRESemme hair stylists will take care of you but, hurry! 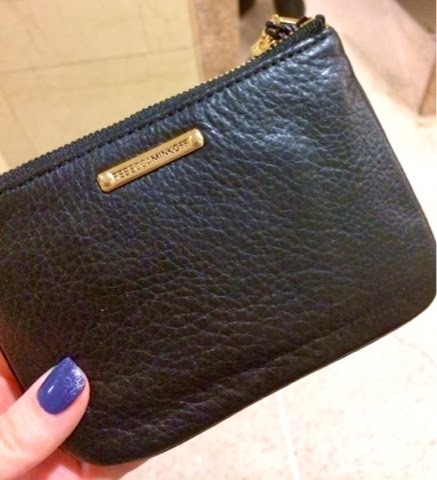 Rebecca Minkoff and TRESemme won't be there for long.